Through devices, your users are getting access to your corporate assets. To protect your corporate assets, as an IT administrator, you want to have control over these devices. This enables you to make sure that your users are accessing your resources from devices that meet your standards for security and compliance. Device management is also the foundation for device-based conditional access. With device-based conditional access, you can ensure that access to resources in your environment is only possible with managed devices. This article explains how device management in Azure Active Directory works. Registering a device to Azure AD enables you to manage a device’s identity. 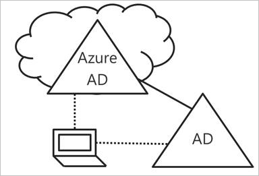 When a device is registered, Azure AD device registration provides the device with an identity that is used to authenticate the device when a user signs-in to Azure AD. You can use the identity to enable or disable a device. When combined with a mobile device management(MDM) solution such as Microsoft Intune, the device attributes in Azure AD are updated with additional information about the device. This allows you to create conditional access rules that enforce access from devices to meet your standards for security and compliance. For more information on enrolling devices in Microsoft Intune, see What is device enrollment? Joining a device is an extension to registering a device. This means, it provides you with all the benefits of registering a device and in addition to this, it also changes the local state of a device. Changing the local state enables your users to sign-in to a device using an organizational work or school account instead of a personal account. The goal of Azure AD registered devices is to provide you with support for the Bring Your Own Device (BYOD) scenario. In this scenario, a user can access your organization’s Azure Active Directory controlled resources using a personal device. The access is based on a work or school account that has been entered on the device. For example, Windows 10 enables users to add a work or school account to a personal computer, tablet, or phone. You can configure Azure AD registered devices for Windows 10, iOS, Android and macOS. Azure AD Join is intended for organizations that want to be cloud-first (that is, primarily use cloud services, with a goal to reduce use of an on-premises infrastructure) or cloud-only (no on-premises infrastructure). There are no restrictions on the size or type of organizations that can deploy Azure AD Join. Azure AD Join works well even in a hybrid environment, enabling access to both cloud and on-premises apps and resources. Single-Sign-On (SSO) to your Azure managed SaaS apps and services. Your users don’t see additional authentication prompts when accessing work resources. The SSO functionality is available, even when your users are not connected to the domain network. Enterprise compliant roaming of user settings across joined devices. Users don’t need to connect a Microsoft account (for example, Hotmail) to see settings across devices. Access to Windows Store for Business using an Azure AD account. Your users can choose from an inventory of applications pre-selected by the organization. Windows Hello support for secure and convenient access to work resources. You want to transition to cloud-based infrastructure using Azure AD and MDM like Intune. You can’t use an on-premises domain join, for example, if you need to get mobile devices such as tablets and phones under control. Your users primarily need to access Office 365 or other SaaS apps integrated with Azure AD. You want to manage a group of users in Azure AD instead of in Active Directory. This can apply, for example, to seasonal workers, contractors, or students. You can configure Azure AD joined devices for Windows 10 devices. IT departments to manage work-owned devices from a central location. Users to sign in to their devices with their Active Directory work or school accounts. Typically, organizations with an on-premises footprint rely on imaging methods to provision devices, and they often use System Center Configuration Manager (SCCM) or group policy (GP) to manage them. 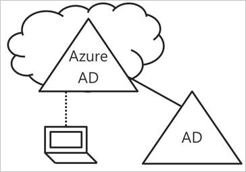 If your environment has an on-premises AD footprint and you also want benefit from the capabilities provided by Azure Active Directory, you can implement hybrid Azure AD joined devices. These are devices that are joined to your on-premises Active Directory and registered with your Azure Active Directory. You have Win32 apps deployed to these devices that rely on Active Directory machine authentication. You require GP to manage devices. You want to continue to use imaging solutions to configure devices for your employees. You can configure Hybrid Azure AD joined devices for Windows 10 and down-level devices such as Windows 8 and Windows 7. To learn more about device-based conditional access, see configure Azure Active Directory device-based conditional access policies. 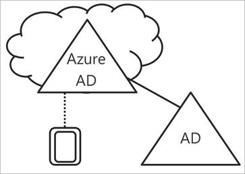 Hybrid Azure AD joined devices, see How to plan your hybrid Azure Active Directory join implementation.